The new species Neodidymelliopsis farokhinejadii, sp. nov., is described and illustrated. This fungus was isolated from dead branches of Citrus spp., Conocarpus erectus, Cupressus sp., Eucalyptus sp., Juglans regia and Ziziphus sp. in southwestern Iran. Multi-locus DNA sequence based phylogeny, in combination with morphology, were used to characterize eight isolates of this species. Two phylogenetic trees were constructed on the basis of the combined sequences of internal transcribed spacer regions 1 & 2 and 5.8S nrDNA (ITS), partial large subunit 28S nrDNA (LSU-D1/D2), partial β-tubulin (tub2) and partial RNA polymerase II (rpb2). 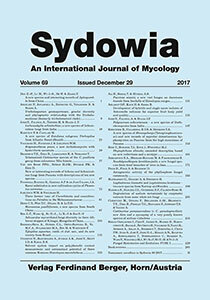 The morphological differences between the new and other previously known species of Neodidymelliopsis are strongly supported by the multi-locus phylogenetic analysis. In both three- and four- locus phylogenetic trees, the isolates of new species formed a strongly supported clade, which is distinct from other formerly described species. Keywords: Didymellaceae, morphology, multi-locus phylogeny, sp. nov.